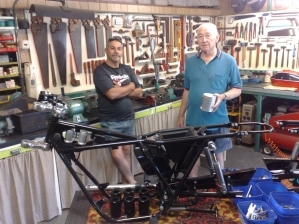 The frame and running gear is gradually being assembled but, like every restoration, we are awaiting news from the chrome plater, the exhaust manufacturer, the painter and a host of others. 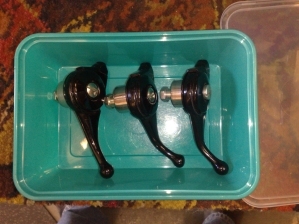 The first week of March saw calls arrive to come and pick up completed parts. 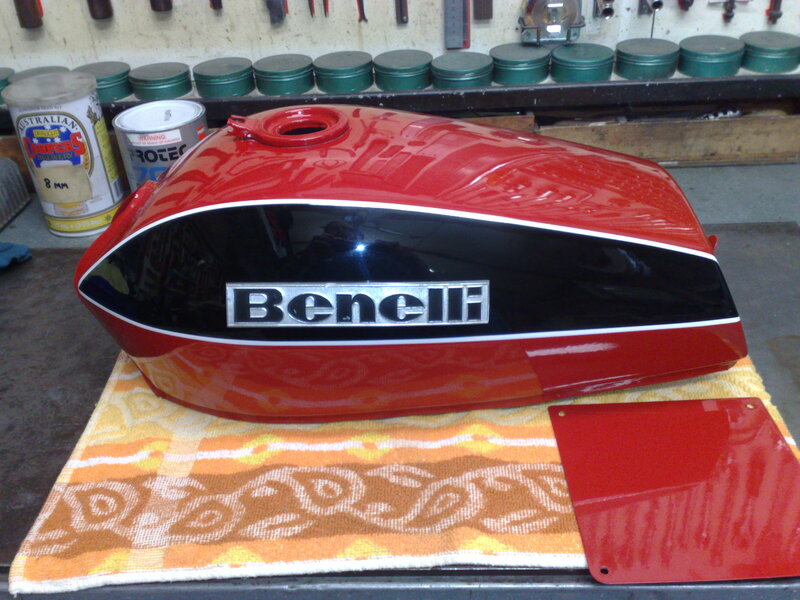 The painter has finished all the red bits - tank, sidecovers, tail light bracket and numberplate holder. He's done a stunning job with hand-finished pinstripes, two-pack paint and gloss clear overcoat. 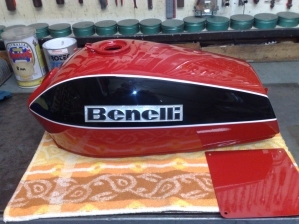 The colour is Ford Monza Red which is not exactly the same as the Benelli red but it so close I can't pick the difference! The tank badge hasn't been refurbished yet - I couldn't resist temporarily putting it on to see how it looks. The Benelli 2C has a cute little choke (air control) lever atop the Tomaselli hand controls. Very 1950s and a little out of place. 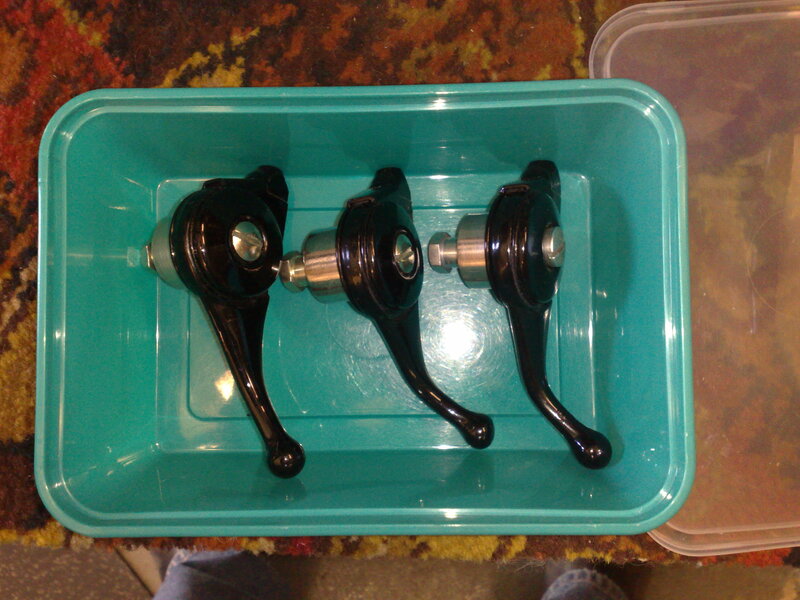 Don stripped the choke levers and repainted them in two-pack black. The shiny metal bits were all bead blasted and zinc plated. We now have three that are like new. 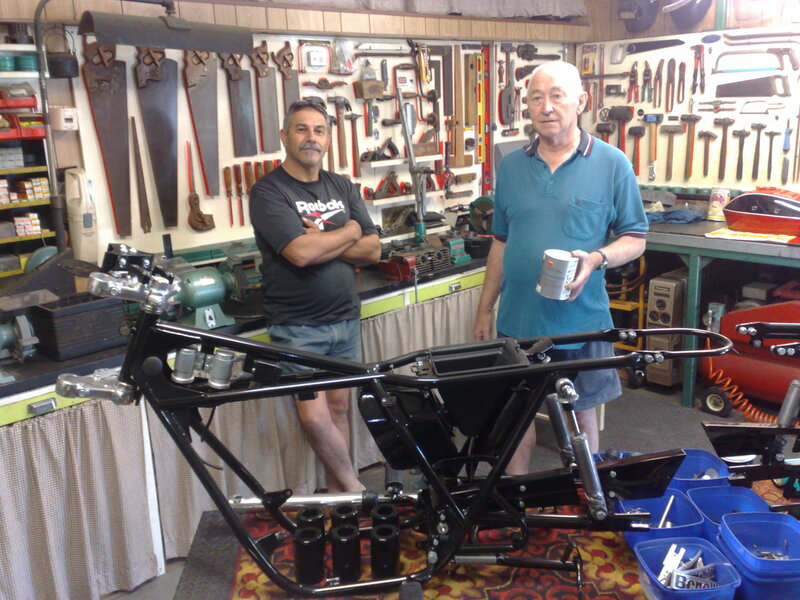 Jim and Don contemplate the Benelli. In the foreground you can see six rear fork shroud covers. These are plastic and were badly scratched and damaged on all the donor bikes. We wanted to retain the original Marzocchi rear shocks so we have rubbed down the plastic shrouds and had them painted with two-pack. The painter used a special additive (Flex-Aid) which gives the paint flexibility when used on plastics. Hopefully this will prevent future cracking. A few people have asked me about the special tool needed for the 2C. The swing arm and (I think) the flywheel are held on by a nut of a strange "four notch" design. You won't find a spanner in your auto shop - but you can make one yourself. 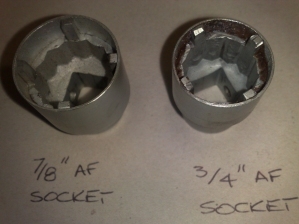 Don used a 7/8" and a 3/4" AF socket and carefully ground down the socket to leave 4 pins (as shown). Use a hacksaw, a dremel and finish off with a file. It's not difficult. Then find a piece of tube which will fit tightly over the outside - only the inside diameter is important. Hold it on with Loktite, silver solder or just make it a really tight fit. Presto - you have your own special Benelli socket!